If you are ordering from Amazon.com (the US Amazon site), please use one of the two direct links, left for print, right for Kindle. Or, order directly from any Amazon site in the world. 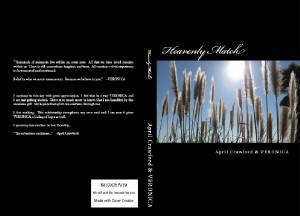 Just search the title in print or for Kindle, "Heavenly Match". 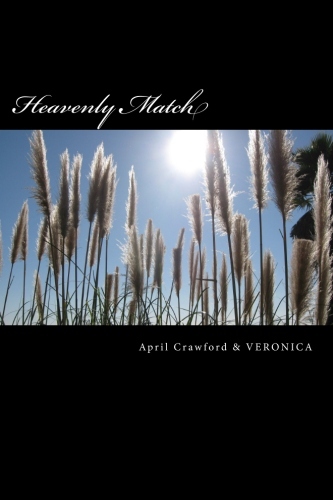 Heavenly Match is the new book from the Entity and Guide VERONICA and Full Body Open Deep Trance Channel April Crawford. There are Two Types of Free Cash Discount Bonus for those who order this book from any AMAZON site on or before the end of April 2014. The only information necessary to receive your free bounus gifts will be the name and the email you used to order the book(s) and the country that you ordered from. See below for details. The thank you launch bonus gifts apply for print and Kindle editions ordered from any AMAZON site worldwide. Just below are the two types of Cash Discount Bounuses for those who order before the end of April 2014. All you or your gift receipients need to do is mention the discount when a session is scheduled, and include the name of the purchaser and the email address used to purchase the book, and the country that the book was ordered from. That's all there is to it! Five Star Reviews of "Heavenly Match"
I would recommend this book to my friends interested in this issues. I think the book is outstanding.thank you very much. What wonderful well written informative book. Being a fan of April and Veronica for years this really answered so many questions for me. It answered some of my questions about Veronica. Who "she" is and how April was chosen. The book made it easier to realize who we are and where we are going. I recommend it to everyone who wants to gain more understanding of this current life and beyond. Like many of April Crawford's books, this gives wonderful insight into the human condition and our connection to the spiritual world. I found it very fascinating! Particularly the perspective of Veronica in her commitment to help those here, and her search for a channel. The reader is able to see April as a real person with other absorbing career interests and channeling wasn't one of them! The story raises questions for me anyway, but I am interested in what goes on behind the scenes. I have read them all and this is another must read if you have any interest at all in what goes on in the unseen world around us. It's wonderful to see how it all happened between April and VERONICA!! So fun to read and to see how the entity of VERONICA goes through finding the right spirit to use as a conduit to share their wisdom and experiences. And so fun to see what April, the reluctant medium, go through meeting VERONICA when April was not even looking to become a medium. I would recommend this book to my spiritual friends. I would definitely recommend this book to anyone interested in this topic! As a matter of fact, I have order multiple copies that were sent to friends. The day I received this book I was just going to start off by reading a chapter or two to get a feel for it and ended up reading the book in one day. A quick and captivating read about the beginnings of a wonderful and humble relationship of a woman and her spiritual companion. I look forward to hopefully more writings about this relationship!!! Loved the book. Its was very unique, interesting and valuable to get the perspective from both side of the veil. Thank you so much for sharing your experiences. I recommend this to anyone with an open mind. We all have God-given gifts to help one another. I chose this rating; because, each one of us is evolving. This is a good message to help and not harm others. Maybe you will get something else out of this book. Looking forward to the next book! The causal plane being describes searching for the required match from earth; the earth channeler describes the experience of the resulting merging. Unique insights into the channeling phenomenon. I read this book in one day. I so wanted to understand how an energy like veronica blends in with a human. I found the whole process so interesting, I could not put the book down. For anyone interested in this subject, this is a good read. This book will be of interest to several different audiences. First of all will be those interested in spiritual metaphysics and consciousness, who happen to also be aware of April Crawford's work in this area. Double that if you are interested specifically in deep trance channeling, reincarnation, and/or spiritual mediumship. However, this is also a set of two interweaving spiritually themed true stories that are good reads as personal memoirs in and of themselves (although April Crawford from childhood through early adulthood had no idea whatsoever that this turn of events would occur). VERONICA of course is a nonphysical Entity and Guide who writes "her" own story from before she incarnated physically the first time to her eventual search for someone physical to serve as a communications vehicle that would allow VERONICA to be of service to those incarnated in this timeframe.. If you like the writings of the Entity Seth or the Entity Abraham, this book will add to your body of knowledge on those "What's It All About Alfie " types of questions. There have been several earlier books written via April Crawford, mostly featuring messages from VERONICA, but also from others about the afterlife. All made the Amazon best seller list in general, and all reached number 1 in various related genres. If you have read and liked some of the other books written via April Crawford, or if you are interested in the subject matter in general, you will probably enjoy this book. In terms of full disclosure, the reason I am able to review this book first is that I wrote the introduction. -Allen, Facilitator for April Crawford, Administrator for VERONICA. As always, April and I thank everyone for your support of our work in this area. We greatly appreciate it.